Frederick Lennox Chalcraft was born on 15 April 1878 in New York. Frederick Lennox Chalcraft and Eliza Jane Olds appeared in the US federal census of 1 June 1880 in Buffalo, Erie County, New York, at 363 Eagle and one young female domestic servant.. Other members of the household included Frederick Lennox Chalcraft, Ida M. Chalcraft. He married Marie Christina Elizabeth Borth, daughter of Frederick Christian Borth and Margaretha Kammerer, on 3 July 1900. The following appeared on 15 July 1900 in the Buffalo Courier: Mr. and Mrs. Fred Borth of Grape Street announce the marriage of their daughter, Christina E., to Mr. Fred L. Chalcraft, Jr., at the home of the bride, Tuesday, July 3d, at 8 p. m., the Rev. E. F. Backman officiating. The bride was attended by Miss M. Delwanit, maid of honor, and the Misses E. Barnett and M. Botha were the bridesmaids. Mr. Joseph B. Decker was best man and Mr. [J.] Kammerer and Mr. G. Borth acted as groomsmen. The house was prettily decorated with palms and ferns. The bride wore a handsome gown of Swill mull and carried bride's roses, the maids pretty gowns of pink and carried pink carnations. The guests from out-of-town were: Mr. and Mrs. [J.] Kammerer of Toronto, Mr. and Mrs. A. Kammerer, Mr. and Mrs. L. Enner, Mr. and Mrs. C. Ford, Mr. and Mrs. W. Shultz, Miss Kammerer, Mr. and Mrs. Vorwerck, Miss L. Eimer, Miss E. Young and Mr. and Mrs. H. Ratzel, all of Niagara Falls; Miss F. Kneller of Fork Station. Eliza Jane Olds became a widow at his death. The following appeared on 28 September 1904 in The Buffalo Courier: Capt. Frederick L. Chalcraft, a well-known navigator on the Great Lakes, died Monday at his home, No. 216 Grape Street, after an illness of several weeks. Capt. Chalcraft was 57 years old. He held many captains' berths on the Great Lakes. His widow Mary, and two sons and three daughters survive. The funeral will be held from the family home this afternoon at 3 o'clock. Frederick Lennox Chalcraft appeared in the US federal census of 15 April 1910 in Buffalo, Erie County, New York, at 31 Benner? Street. Other members of the household included Frederick L. Chalcraft and Robert Albert Chalcraft. He was employed as an upholstery salesman, according to the 1910 census. 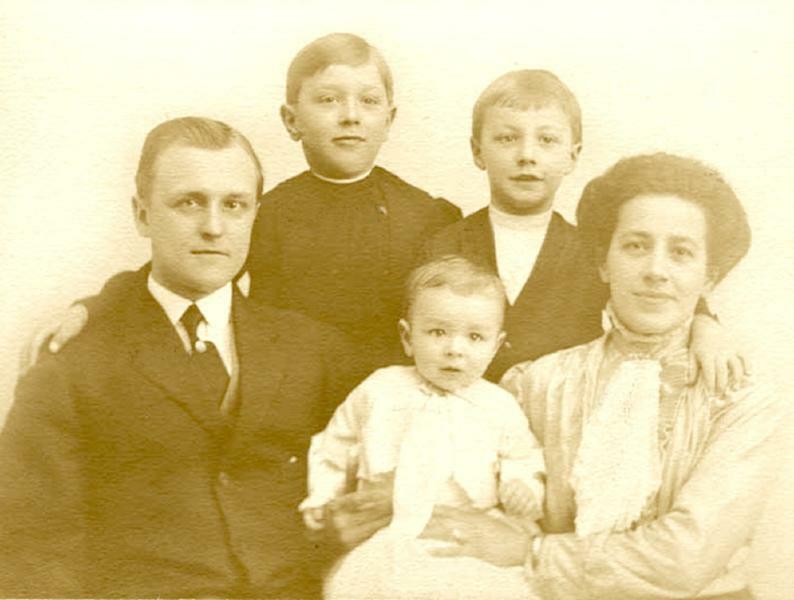 A photographic portrait was made of the Chalcraft family about 1912. Frederick Lennox Chalcraft registered for the draft on 12 September 1918 while living with his wife Christine at 211 Bissell Avenue in Buffalo, and employed there as manager and buyer for H. A Meldrum Company. Frederick Lennox Chalcraft and Marie Christina Elizabeth Borth appeared in the US federal census of 1 January 1920 in Buffalo, Erie County, New York, at 348 Goodyear Avenue. Other members of the household included Frederick L. Chalcraft, Robert Albert Chalcraft and Edward L. Chalcraft. He was employed as a buyer by a department store, according to the 1920 census. Frederick Lennox Chalcraft became a widower at the 28 August 1924 death of his wife Marie Christina Elizabeth Borth. He married Anna P. Roeseler, daughter of Bemeranda (?). He was employed as a buyer for an interior decorator, according to the 1930 census. Frederick Lennox Chalcraft died on 29 December 1944 at age 66. Anna P. Roeseler became a widow at his death. He was interred at Mount Calvary Cemetery, Cheektowaga, Erie County, New York.